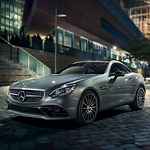 The new Mercedes-Benz SLC 300 Roadster is a popular and powerful coupe sports vehicle. Even though Mercedes-Benz vehicles in general are known for their outstanding power and maneuverability, the new SLC 300 Roadster takes things to a new level. It does so with outstanding motor performance as well as solid transmission backup. The Mercedes-Benz SLC 300 brings the power of a 2.0L in-line 4-cylinder engine. Like many similar motors, the SLC 300 engine comes fully equipped with a Mercedes-Benz turbocharger under the hood. The turbocharging system works hand-in-hand with a multi-sparking firing system and high-energy direct injection fuel provisions. These features alone help to serve up a good portion of the available 273 foot-pounds of torque. Handling the great power produced by this motor is a proprietary Mercedes-Benz 9G–Tronic auto transmission. This highly engineered system equips drivers with 9–speeds of gear shifting capability. The inclusion of 9–speeds allows for wider power ranges while also diminishing the size of step changes. Along with the available steering wheel mounted paddle shifting system, this unique transmission gives SLC 300 drivers the performance that they crave.